The people living in riverine char areas of greater Rangpur region are expecting better profit this year by selling their locally-reared sacrificial animals before the Eid-ul-Azha festivity. Like previous years, this year the char people have reared thousands of animals to meet the demand for sacrificial animals, reports BSS. Divisional Deputy Director of the Department of Livestock Dr Sheikh Azizur Rahman said the cattle markets are witnessing record supply of locally-reared cows, bullocks, goats and other sacrificial animals in the region. “The animal husbandry sector has expanded everywhere, including char areas, as common farmers and char people are rearing animals on a commercial basis in recent times and many of them have changed their fortune,” he said. “The char people started taking special care of their reared bullocks, calves, cows, oxen, buffaloes, sheep and goats and fattening those since last month to have better price following huge demand of those in local markets,” he added. Talking to BSS, Shawkat Ali Sarker, Bir Bikram, Chairman of Chilmari upazila in Kurigram, said the animal husbandry sector have boosted in char areas after realisation of many projects with government assistance under the social safety-net programmes. “Thousands of poor char families have already achieved self-reliance through animal husbandry along with conducting other income generation activities though they struggled for their survival even a decade ago,” he said. Chilmari Upazila Agriculture Officer Khaledur Rahman said the animal husbandry sector has marked huge boost in char areas following production of grass there and flourishing char economy and increasing meat and milk production. District Livestock Officer for Rangpur Dr Mahbub Alam said many char families are rearing cows to earn profits and add to their capitals after meeting nutritional demand, expenses for living and education costs of their children. 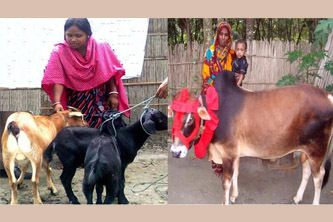 Char dwellers Kobiza Begum, Morsheda Khatun and Abdur Razzaque of village Paschim Mohipur under Gangachara upazila in Rangpur narrated their success stories of winning over extreme poverty through rearing cattle heads in recent years. Similarly, Saleha Begum, Mariyam Nesa, Mozaffar Ahmed and many others of different char villages in Kurigram, Rangpur, Lalmonirhat and Gaibandha narrated their successes achieved through animal husbandry. “I am taking special care of my two bulls to sell those at between Taka 80,000 and 120,000 in local markets before the Eid-ul-Azha,” said char dweller Abdur Razzaque of Paschim Mohipur in Gangachara upazila of in Rangpur. Char people Abdus Sabur and Nurul Amin of Char Machabandha village in Chilmari upazila of Kurigram said they were expecting to sell their 11 healthier bulls, at between Taka 80,000 and 100,000 each, though they bought those two years back at between Taka 20,000 and 35,000 each. Char dweller Abdul Ahad of Astomirchar in Chilmari upazila in Kurigram said he already has sold his five Black Bengal goats at Taka 68,000 and six sheep at Taka 33,000 after purchasing those together at Taka 35,000 last year.